After years of design charrettes and lengthy discussion about how the new Silver Spring Library should look and function, the County's Department of General Services presented final drawings at a meeting last Saturday. Today, we'll present three brief posts summarizing what happened, what the new library will look like, and how the community responded. About thirty people came to the basement of the current library on Colesville Road to see the design process come to fruition. Chief engineer Don Scheuerman was on hand to talk about the seven-story facility, as were architects Greg Lukmire and Bill Evans of the Arlington-based Lukmire Partnership, best known for designing libraries in Germantown and Shirlington, in addition to the new Francis Scott Key Middle School in White Oak. While earlier iterations of the library (warning! PDF file.) showed a monolithic building with small windows, the final design features lots of glass. "We wanted people inside to be able to watch the world go by," says Lukmire. ""Natural light and natural views are very important to healthy people, so we wanted to make the building very open." 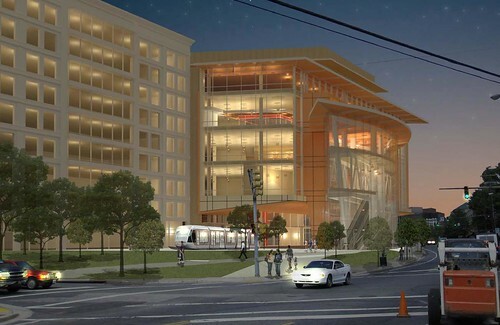 The architects say they want the library to "glow like a lantern" at night. Pictures released two weeks ago showing the library covered in bright orange have earned it comparisons to a Howard Johnson, but the architects say exterior materials and colors haven't been finalized yet. "There are certain aspects of [the existing] library that everybody likes," says Evans, noting the liberal use of wood and stone and the intimacy of the reading room. "We're gonna do what we can to recapture the warmth of the current library." "There's been no consensus about what it should look like," Lukmire says of the library's protracted design process, "other than it looking like a civic building and a library." Scheuerman says that work at the library site will begin soon, but that you shouldn't expect to see actual building start for at least a year. Demolition of existing buildings on Wayne Avenue and Fenton Street will begin in "45 to 60 days," he says, followed by site surveying through the winter. Relocating utility lines will begin next July and take between six to nine months, meaning construction, which could take anywhere from 26 to 30 months, will start in the winter of 2011. As a result, the library should open some time in 2013. 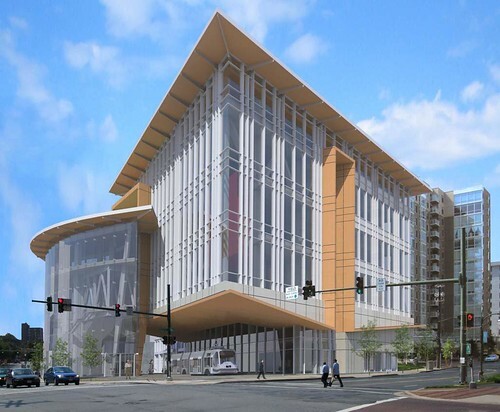 Check out this slideshow of images from the Silver Spring Library, including exterior renderings, interior renderings and selected floor plans. For more images and information, visit the Department of General Services' web page for the project. What an ugly building! I'm looking forward to the new Library, but why does it have to look so unwelcoming? The architects where hell-bent on making a "statement" from the first charette, it was just a matter of outlasting all the people at the meetings who asked for something better. All the creepy orange lighting won't cover up the fact that the architects are shoving their masterpiece down Silver Spring's throat. They can't even make a sensibly shaped public space. What a shame. Bonifant Street is getting a loading dock and an escalator. It looks like the rear end of a carport. Why can't the library face Bonifant instead of the parking garage? Where are the green roof and teaching gardens promised? Is this building going to be LEED certified? ?